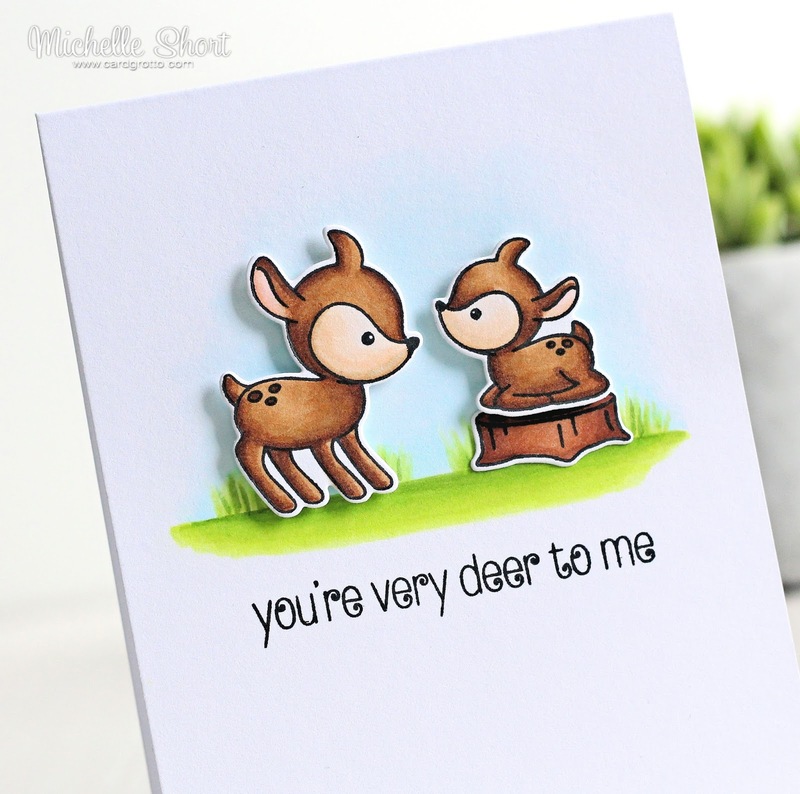 Hello there, today I have a cute card to share using the adorable Woodland Kisses stamp set from Clearly Besotted. I started off by stamping the deer's and the log on to some white cardstock using memento Tuxedo Black ink. These were coloured using Copic Markers and then cut out using the matching dies. I then took a 4"x5" white card base and drew on some grass with Copic Markers. I also added in a faint sky with blue Copics. The sentiment, from the same set, was stamped below with black ink. The log was adhered to the card base with tape runner and then the deer's with foam tape. COPIC MARKERS: Deer's - E59, E57, E55, E53, E50, R00. Grass - YG17, YG23, YG03, YG01. Sky - B000, B0000, 0. I have to say, I do like how this card came out. I wasn't sure while I was making it that I would! I am really enjoying creating some simple copic coloured cards, as part of the 30 day colouring challenge. I am colouring the images in on the day and then later making them into cards. Are you taking part in the challenge? I hope you are enjoying it as much as I am! Thanks so much for visiting me today. I hope you have a fabulous day! 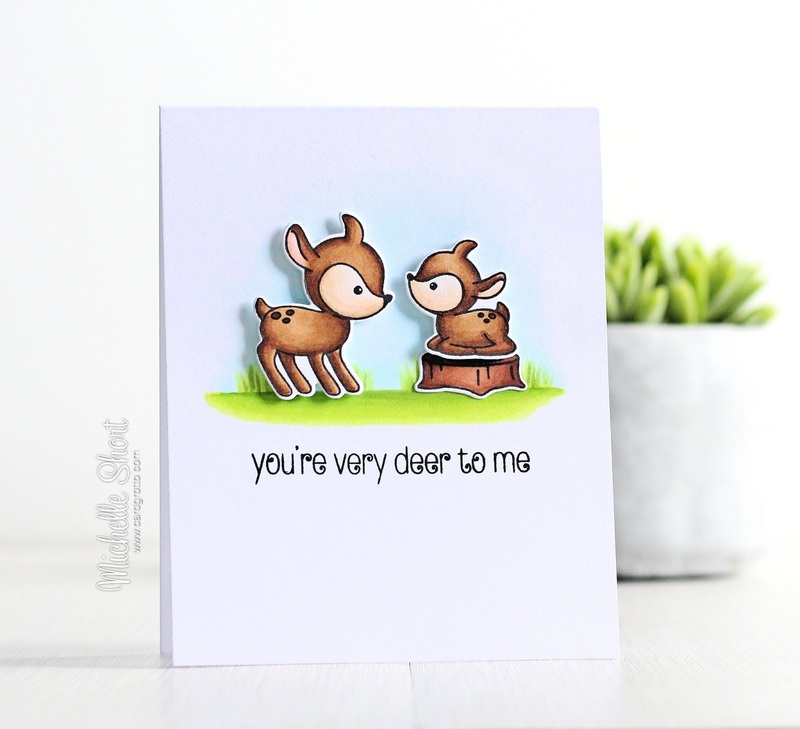 Your card is colored beautifully and is a"deer"able!!! How cute is this card Jennifer McGuire is right you are talent.